The following Art Talk was written by Hannah Bustamante, Tech Pointe Administrative Assistant, and was published Friday, November 9, in the Ruston Daily Leader. Although the opening reception has passed, the exhibition will be on display through December 21, and the artist will give an Artist's Talk on December 5. 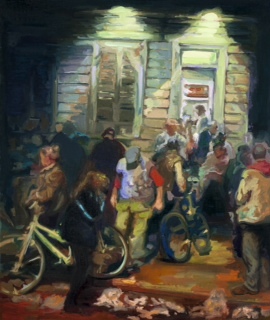 The Enterprise Center Gallery presents a new exhibition “Ghost Cycles” featuring paintings by artist Nicole Duet. This exhibition is open to the public today through December 21, with an opening reception tonight from 6:00 – 8:00 p.m. Both the reception and exhibition are free and open to the public. Don’t miss the opportunity to view the work and visit with the artist tonight! Then on December 5 at 7pm, she will be giving an artist’s talk on her work and experiences. Nicole Duet is an artist originally from New Orleans and currently working as Assistant Professor of Drawing and Painting at the School of Art at Louisiana Tech University. She received her MFA in Drawing and Painting from California State University Long Beach receiving the College of Liberal Arts Award for Distinguished Achievement in Creative Activity. In this body of work, Duet has taken poignant moments or encounters and has frozen them in space and time. The subjects in the painting are at times blurred giving the definite feeling that what is being captured is active and in motion. The work strongly conveys the idea of transition and the need to define one’s sense of self. The Louisiana Tech Enterprise Center houses the Louisiana Tech Technology Incubator and the Technology Business Development Center. As the primary business support and development outreach arm of Louisiana Tech University, Louisiana Tech Enterprise Center is designed to facilitate and promote the growth of new and existing ventures of the innovation enterprise in the I-20 corridor of north Louisiana. The Enterprise Center Art Gallery proudly features the work of Louisiana Tech students, faculty and staff. For more information about our programs and exhibitions, please email hannahb@latech.edu or call our office at 318.257.3890. The Enterprise Center is located at 509 West Alabama Ave, Ruston, LA 71270. We are open to the public Monday – Friday, 8 a.m. – 5 p.m.